There are few better ways to enjoy good, wholesome bonding time with the family than by traveling altogether; and an adventure to Brazil is sure to bring no end of unforgettable memories with your loved ones. Whether on a voyage by boat or train, discovering extraordinary places by biking or hiking, or indeed just relaxing on Brazil’s blissful beaches; there are countless opportunities for sharing special moments together. From soaring green mountains to sparkling sapphire seas and mighty waterfalls, young explorers will be just as thrilled as the grown-ups at the surprises that Brazil has in store. Airport arrival at Curitiba, capital of Parana state and transfer to our hotel. And as good as fresh coffee, you can’t wait to drink it, the best time to start the trip is now. Soon after check in, mounted on our bikes, we’ll visit some of the most welcoming and important coffee shops of Curitiba, tasting the best Brazilian coffee prepared by rewarded baristas in Brazil and abroad. Each of the stops is made with a commented tasting, giving coffee lovers contact with at least 4 different types of specialty coffees. But not only the types of coffee show us the diversity of this delicious universe; in the Coffee Bike Tour we will be amazed at the different brewing processes offered by coffeehouses of Curitiba, such as the traditional espresso, the French press, aero press and differentiated brewed using the Hario V-60. Because coffee is a good partner for all hours and cafeterias in Curitiba offer us the best in specialties! Accommodation. After breakfast, we check out and leave Curitiba towards Pontal da Graciosa. From here, we’ll mount our bikes again until reaching Morretes, witnessing the incredible scenery of the Serra do Mar. We will have lunch in Morretes a typical regional dish called barreado and seafood. After lunch, we’ll take a walk in the historic downtown of the city and then to our pousada to check in. Accommodation. After breakfast, we will go out for a bike ride in Morretes through rural villages, crossing rivers and streams, fountains of water, places with mountain views, an artisanal cachaça mill, natural pools, a small waterfall, lakes, woods and a suspension bridge. We will return to the pousada to check out and go to Pontal to catch the ferry bound for Ilha do Mel, a beautiful island located in Paranaguá with 25km of beach and quite a lot of preserved area. 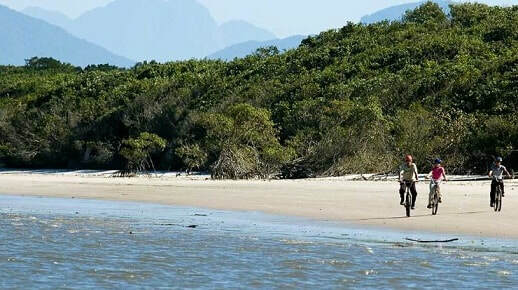 We’ll go to our lodge and enjoy a free afternoon in Ilha do Mel. Accommodation. Free day to enjoy the island. Accommodation. After breakfast and check out, we go back to catch the ferry to Pontal do Sul, then land transfer from to Curitiba airport to fly to Foz do Iguaçu. Arrival in Foz de Iguaçu and transfer to our hotel. Iguaçu River wriggles in a western direction for 600 km, picking up along its way the waters of dozens of tributaries. The river widens and flows majestically through forests before descending into the various levels of the famous Iguassu waterfalls. They consist of 275 waterfalls that occupy an area more than 3km wide and 80m tall. They are wider than Victoria Falls, taller than Niagara Falls and more beautiful than both. There are neither words nor photographs that can properly describe them, you simply must see and hear them for yourself. Accommodation. After breakfast we will visit the traditional runways with a wonderful panoramic view of the Brazilian falls. The total length of the runway is 1200 meters from where we get a spectacular panoramic view of the 275 waterfalls that make up the Iguaçu Falls; the most important on the Brazilian side are four: Floriano, Deodoro da Fonseca, Benjamin Constant and Salto Uniao or Devil's Throat. Once finished the tour, we reach the panoramic elevator that brings us back to the vehicle to complete the itinerary. Still inside the Brazilian side, at Parque das Aves (Bird Park) we will experience direct contact with more than 1020 birds covering about 150 different species. There are 16.5 hectares of protected lush Atlantic Forest to form the best habitat for animals. It is a unique and unforgettable experience in which we’ll find amazing birds from the four corners of Brazil and all over the world, many of them endangered. At night, we will feel the magic and hear a legend: theTupi-Guarani name, Iporã, reflects the beauty of the water, represented here on a show that demonstrates the cultural diversity of nine countries in Latin America. The presentation begins with a musical retelling of the Legend of the Falls where Naipi and Tarobá are punished for living a forbidden love. Next, we will see all the beauty of the presentation. Songs and dances portray the folk diversity: from the Caribbean salsa to the Pampa’s malambo. The richness of the show is completed with stunning costumes and scenarios. Return to the hotel. Accommodation. After breakfast we visit the Iguazú Falls on the Argentinean side. Recognized among the seven natural wonders of the world, the Iguazú Falls are the most visited natural attraction in the province of Misiones and one of the most impressive of Argentina and the world. Walking paths with different gateways offered by the Park may have a different view of the falls’ amazing scenery. The lower circuit allows more contact with nature, while the upper circuit gives an overview of all the jumps and the delta islands, and the impressive view of the Garganta del Diablo, where we feel the fury of water falling in many horseshoe shaped falls. Enjoying more from the Argentinean side, we will see the essence of the Iguazú National Park: jungle and falls in a single ride. This 5km car ride ends at the forest base Puerto Macuco. Going 100 meters down we arrive at the dock where we will meet the boats that lead us 6km through the canyon of the lower Iguaçu river towards the waterfalls while enjoying the rapids. Then we will reach the peak of emotion when facing the incomparable Salto San Martín, second on the scale and the largest approachable jump by boat. Finally, we land at the dock located in front of San Martin Island, where we will return to the runway system, through the Lower Circuit. Return to the hotel. Accommodation. Transfer to the airport of Foz do Iguaçu for departure to Rio de Janeiro. Airport arrival at Rio de Janeiro. The Carioca City has a magical quality and offers the traveler a wide variety of touristic sights and a daily program with great number of leisure activities. Transfer from the airport to the hotel located on the famous beach of Copacabana. Accommodation. After breakfast, we will start a tour that covers the most famous spots and the most beautiful landscapes of Rio. We’ll visit the main touristic city icon and one of the Seven Wonders of the Modern World, Cristo Redentor, with access by train through the lush Tijuca Forest. After that, we will get to the Pão de Açúcar lookout, where we’ll enjoy one of the best views of Rio de Janeiro. The ascent and descent to reach the top of the lookout are made through a traditional cable railway. Then we return to the hotel. Accommodation. After breakfast and check out, we will transfer by road to the coastal town of Conceição de Jacareí, where a flexboat will be waiting to transport us to Vila do Abraão, the only town in Ilha Grande. We will check in at our hotel and begin to experience the nice and peaceful atmosphere of the island. Accommodation. We go out in regular schooner from port towards the Lagoa Azul, where we can find stunning places that preserve the wild and natural environment. Stop between two islands. In the shallow transparent blue waters, we see the background of beautiful coral and many colorful fish that feed themselves from the people’s hand; all this makes the Lagoa Azul one of the most visited places on Ilha Grande. We continue the tour with a stop at Freguesia de Santana Beach. Here we will visit two lovely beaches as well as the Church of Santana (1796). We return to our boat and we stop in Japariz beach where we can stay for a while or go to a typical food restaurant in the area. Accommodation. Free day to relax in this paradise or take part in optional activities, like visiting the Lopes Mendes beach, one of the most famous in the country, a ride on boat around the island or the possibility of snorkeling inside a secluded grotto. Accommodation. o Shorts, swimsuit or bikini, insect repellent, sunscreen and sunglasses. o A bottle to drink water, avoiding the use of disposable containers. o Especially in winter (June to September) we should bring warm clothes for the night. o Good, comfortable shoes, for historic cities have cobblestone streets. o This trip can be made throughout the year, considering that between June and August is the coldest winter, and between December and March is the hottest summer. o Between September and April, the temperature of the waters is warmer and therefore it is a better period to swim in the ocean or in lagoons. The exchange and/or cash withdrawal at ATMs is preferably done at airports for security and because most experiences take place in locations with little banking structure. o From day 10, The SIB transfers are quoted with vehicles from Rio de Janeiro's south and center neighborhood and airports (GIG/SDU) with Car + driver 1 to 3 pax and Van + driver 4 to 10 pax. For other locations, please request additional price for PVT transfer. o Transfer time from Rio de Janeiro is 07h30, 11h30 and 15h00, arriving in Ilha Grande at 10h30, 14h30, 18h00. Transfer time from Ilha Grande is 09h00, 12h00 and 17h30, arriving in Rio de Janeiro at 12h00, 15h30, 20h00. o SIB boat tour in Ilha Grande are in Portuguese. For a more complete experience, please request availability and additional price for extra guide. Minimum of 10 pax to ensure the realization of the tours. If at the day of the activities does not reach the number of people, they will be changed to the next day.